Radix carbonica is the oldest known fossilized remains of root meristem which was actively growing at time of fossilization. (Image credit: Alexander (Sandy) Hetherington of slide number 81 with the permission of the Oxford University Herbaria). Meristems are groups of undifferentiated cells found in growth zones of plants. Active meristem zones have a different cellular organization than inactive zones, and up until recently no fossilized active root meristem had been found. A team of scientists recently found and described the fossilized remains of an actively growing root meristem dating from the Carboniferous. The fossil, named Radix carbonica, was determined to have been actively growing at the time of fossilisation based on the size and number of cells which radiate outwards from the root tip. 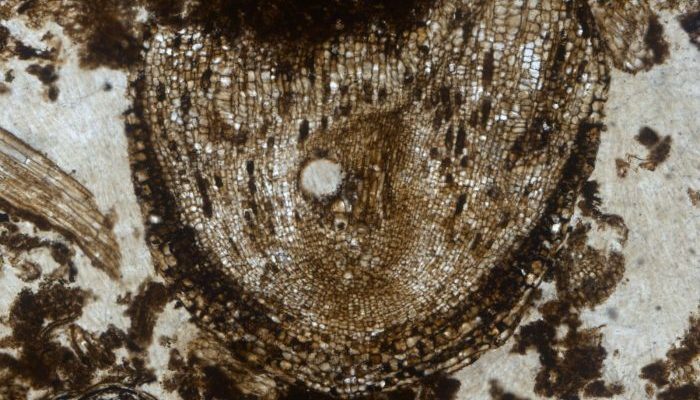 The organization of stem cells and differentiating cells found within the fossilized root tip is dramatically different from modern root types and the authors conclude that distinct root types present in the fossil record are now extinct. To read more about this work read the article by Hetherington et al (2016).